Better carry your infant in a harness rather than a stroller - more than 400 steps to the Grotto! Don't forget to take a tour of the many site attractions: Peuple des Glaces, Glaciorium, the Temple of nature, the Ice Grotto. High-altitude site: bring warm clothes! The tour of the “Grotte de glace” (Ice Cave) takes visitors into the very heart of the glacier. Re-sculpted every year, it describes the life of mountain people in the early 19th century. It can be entered either by a walk of around 20 minutes on a footpath, or by gondola lift. NB: There are about 480 steps from the arrival of the gondola lift to the entrance to the cave. 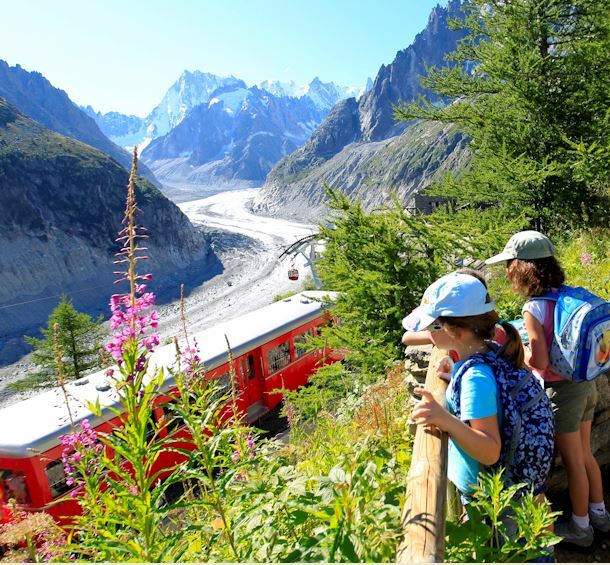 A world of discovery awaits you at the new exhibition centre at the Montenvers Mer de Glace. Here the creation and evolution of the glaciers over the centuries is explained in detail. The complete tour (including the cave and travelling time) takes an average of 2 to 3 hours. The time required for the tour may be doubled during peak periods. Hill-walks include the hike from Montenvers to Plan de l'Aiguille via the Grand Balcon Nord hill-walking trail, and also the return descent down to Chamonix via Les Planards or Les Bois village. There are three choices for eating : either a Savoyard or traditional meal at the Restaurant du Refuge du Montenvers, or a lunch in the bistro with a view at Panoramique Mer de Glace or finally a quick snack at the Glacier Bar. Hotel du Montenvers had open again the 1st of July 2017 after refurbish by the Maisons et Hotels Sibuet label, a pioneer in the mountain hotel business for over 30 years. Terminal Neige – Refuge offers a 10-bed dormitory, double and family rooms, as well as suites, all in a traditional mountain refuge setting. Cash desks open all year round from 8 am to 6 pm. Disabled: 50% discount when presenting an invalidity card + 50% for the accompanying person. Departure times daily every hour between 10 am and 4 pm. Departure every 30 minutes in the afternoon, depending on the affluence. Last departure to visit the ice cave at 2pm. Departure times daily every hour between 10 am and 4.30 pm. Last departure to visit the ice cave at 3pm. Departure times daily every 30 minutes between 8.30 am and 4.30 pm. Be careful, from May 6 to May 10, 2019 and from June 3 to June 7, 2019 the ice cave and the cable car are closed. From 13/07 to 25/08/2019, daily. Departure every 30 ou 20 minutes, depending on the affluence, from 8am to 6pm. Last departure to visit the ice cave at 4.30pm. Departure times daily every 30 minutes between 8.30 am and 5 pm. Last departure to visit the ice cave at 3.30pm.